It feels like I’ve been in Busselton much longer than three weeks. I’ve settled into life here – training, eating, shopping for more to eat, training, eating, sleeping… The usual routine. As my intermittent posts have hinted it’s not always been perfect training, but it’s also not been bad training. I may have turned into a fair weather triathlete thanks to the endless summer! However a week of excellent conditions is leaving me with no excuses. Well other than the imminent race to prepare for. I have a taper plan in hand, but we’ll save that for another post. Today it’s all about life in Busselton and the pleasures of training in South West Australia. This is a quieter corner of the country and the pace of life tends to match. Not that I live a high paced life these days anyway. It suits me well. Busselton has a large, active if slightly ad hoc training group. Sessions are regular and you soon learn the pattern. This also means you know when things are going to be tough out there on the road. I’ve mentioned before, the group can be merciless at times. It all ends with a coffee though and everyone is welcome. Once everyone has headed off to work I’m left with a full day of training ahead. I’ve been fortunate that one of the local guys (another Russ) is on leave and around to train. Plus now Steven and Jo are down this way there’s more of us full timers about! With Steven around it’s also meant riding a little further afield. The picture at the top is from one of my first long rides down here. I cleverly plotted out a course and downloaded it into my GPS. 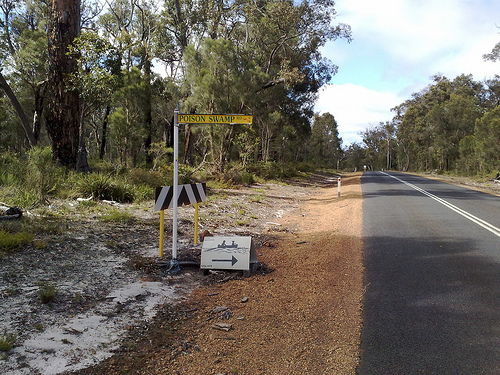 All the way to Margaret River on backroad, no need to go near a busy highway. Excellent. Well aside from the seven separate Magpie attacks there was the point where I hit this dirt track. Now google maps called that a road, whilst I personally consider it a dirt trail! I remembered back on the Gold Coast having encountered something similar in the Tweed Valley. They were resurfacing the road and had just not got round to putting the hotmix on top. So I figure it’s probably only a kilometre long then back to real roads. After 1km of cyclocross on a road bike I decide that I’d best head back. I got to Margaret River on the highway that day. I learnt that these were indeed roads and many cars and trucks use them. The surface is a mix of loose and packed dirt and gravel. Sometimes fine to ride on, sometimes not. The next time I went on a big ride I thought I’d been even smarter. Zooming in on the Satellite view in Google to check the roads! It worked so well until the final section of my route. The first warning was when the road I’d expected to take didn’t appear to exist. I continued on and found an alternative which soon got me back on track. The road climbed up as I expected heading towards an intersection with Sues Road that would bring me home. Then 2km short, dirt track! I wasn’t going to retrace my steps so I pushed on. Riding the dirt as best I could and admittedly dismounting once or twice. I didn’t want to go injuring myself on some silly endeavour. There was a tense moment when I passed a dead Emu in the road, this seemed the most inopportune and so most likely moment to take a fall. Fortunately I made it past, but was left wondering why the flies seemed more interested in me than the rotting body! Once I made it to Sues Road it was an easy ride home. This weekend Steven and I headed out for a long ride. With maps checked along with local knowledge we were at least confident we wouldn’t be encountering dirt tracks. Our route once out of Busselton comprised of about five different roads in total for a loop of over 180km. It’s a different scale to back home for sure! Heading out at 5:30am on Sunday we took the longer route to Nannup. I felt doing the larger distance first would be better and I think we were both glad of this by the end. Early on we were enjoying the ride back down Sues Road, going beyond the point the locals normally turn at. We were entering unexplored territory! The enthusiasm continued for quite a while. I commented that I couldn’t understand why the locals didn’t ride further down here often. By the end of Sues Road I was beginning to understand. For over an hour the scenery had changed so little. There were positives. In two hours of riding we’d seen just three cars. Isolation has its advantages I guess, but the ride was also becoming mind numbing. 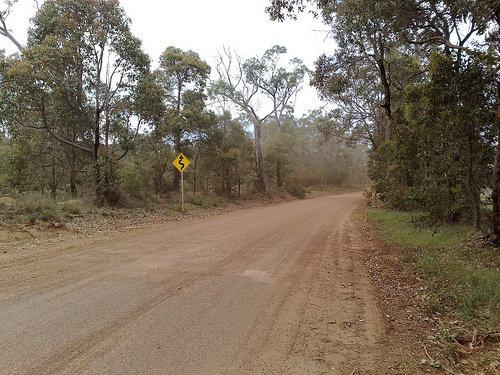 We turned onto the Brockman Highway heading to Nannup, faced with more of the same. Less than halfway into the ride and I found myself looking at the speedometer and counting down the kilometres. I realised a reason locals don’t come down here that much is it’s not very exciting. The roads look the same out in the middle of nowhere and at least if you do loops close to home you can get help easily. Now to be fair things picked up about 20km out from Nannup. First we came across the Poison Swamp! Offering boating opportunities too! I think it needs to work on its branding to be honest. Not long after it was a herd(?) of Emus! Wanting to cross the road, but afraid of the cyclists they ran along the side threatening to dive into our path at any moment. I had fears of being taken out of the race by a rampant Emu. At least I’d finally seen live ones. Too many of my wildlife encounters take the form of road kill. Nannup was a welcome break. Coffee and brekkie. I’ll confess to being non-Paleo and indulging in some cake, but when those sugars kicked in they helped get me home! After the repetitiveness of the last four hours riding we lacked enthusiasm for the trip home. Still we had to do it and we’d been told the Vasse Highway was a nice road. Frankly it wasn’t that much better than any of the previous ones we’d been on. I found myself settle into a sugar fuelled consistent pace just clicking off the kilometres until we were close to home. That was pretty much it for the ride, pushing along tree lined, quiet roads until we were back to familiar territory. A combination of those sugars and a desire to get things over with helped me keep a good pace right to my door! I’d say the riding here is good, but you almost need a different frame of mind. Often you’re alone out there on the roads and miles from civilisation. Packing spare food and plenty of fluids is a must. You can’t entirely rely on mobile phone reception so I’m not sure I’d fancy riding some of those routes alone. The toughest aspect can be the mental one, simply dealing with the seemingly endless roads with little to distinguish them. On the other hand at times it’s a simple motivator to get the job done and get yourself home! I’ve left no time to mention the swimming or running. Another post perhaps. With the weather like it is at the moment the ocean is spectacular. Swimming in it or running along the beach front is a real pleasure. I even got to see more live wildlife on my run the other day in the form of a snake. Poisonous too I believe!